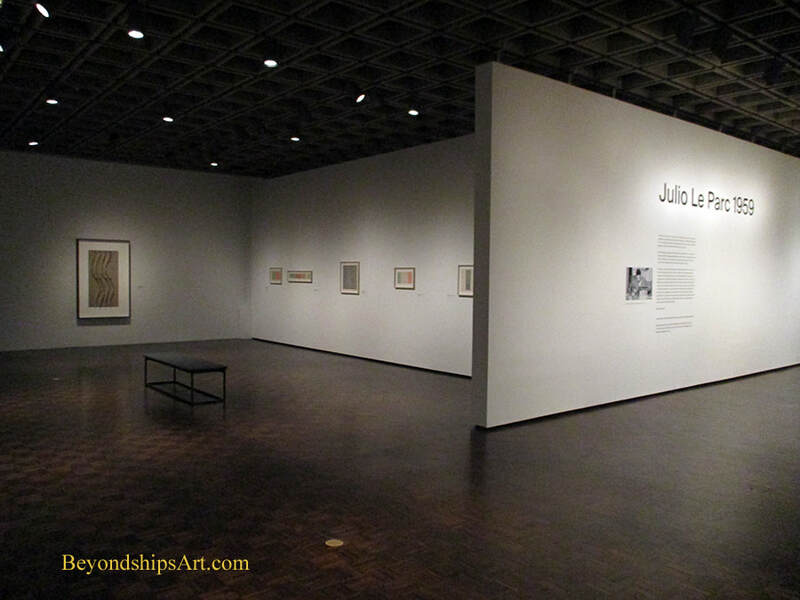 “Julio Le Parc 1959” at the Met Breuer in New York City presents some 50 works donated to the Metropolitan Museum by Mr. Le Parc. The majority of these works are gouaches created in 1959, which was a transitional year for the artist. Mr. Le Parc was born in Mendoza, Argentina in 1928. At the age of 13, he moved with his mother to Buenos Aires. Early on, he had displayed an interest in sketching and artwork so he enrolled in the School of Fine Arts In Buenos Aires. There he studied with Lucio Fontana and became interested in abstract and avant garde art. In 1958, Le Parc received a French government scholarship and moved to Paris. Influenced by the Op art work of Victor Vasarely, the writings of Piet Mondrian and the tradition of Constructivism, Le Parc began creating geometric abstractions. During the 1960s, he developed an interest in kinetic art and began to create pieces that had movable parts, sometimes including motors. He also became interested in using mirrors and lights to create immersive works using lights and mirrors in order to involve the spectator in the work. Now 90, Le Parc continues to reside in France. The vast majority of the works at the Met Breuer are relatively early works of geometric abstraction. They consist of sequences and progressions, sometimes in black and white but most often in color. The marks form static patterns but they seem to move and flow as you view them. Thus, they foreshadow Le Parc's later works both in the fact that they involve movement and in that the spectator is involved in creating the art. Also included in the exhibition is a work that actually does move. 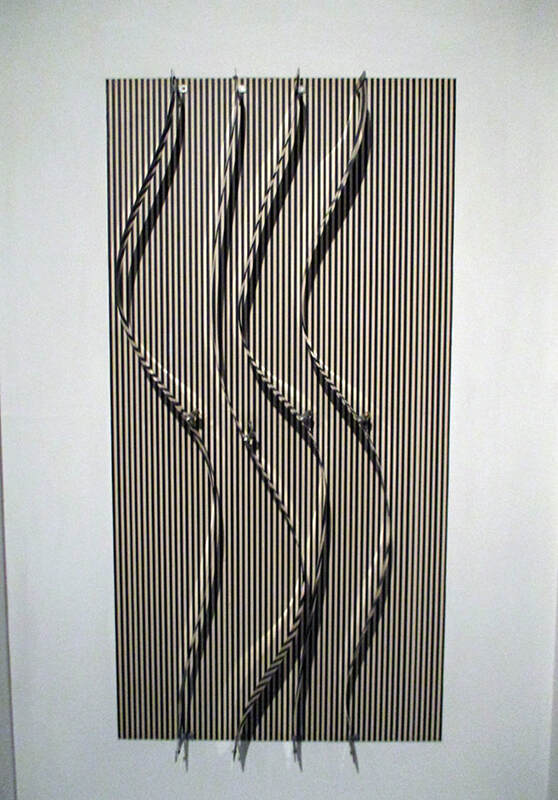 “Form in Contortion Over Weft,” done in 1966 has four vertical strips mounted in front of a striped panel. Motors cause the four strips to bend and move creating serpentine patterns. Another example of Le Pe Parc's post-1959 work is “Continual Light Cyliner” (1962/2018). This immersive installation involves projecting light through Plexiglas mirrors in a darkened room. This is an enjoyable exhibition. The designs are aesthetically pleasing and sometimes hypnotic. In addition,it is interesting to see the early development of ideas that would emerge in the artist's later work. 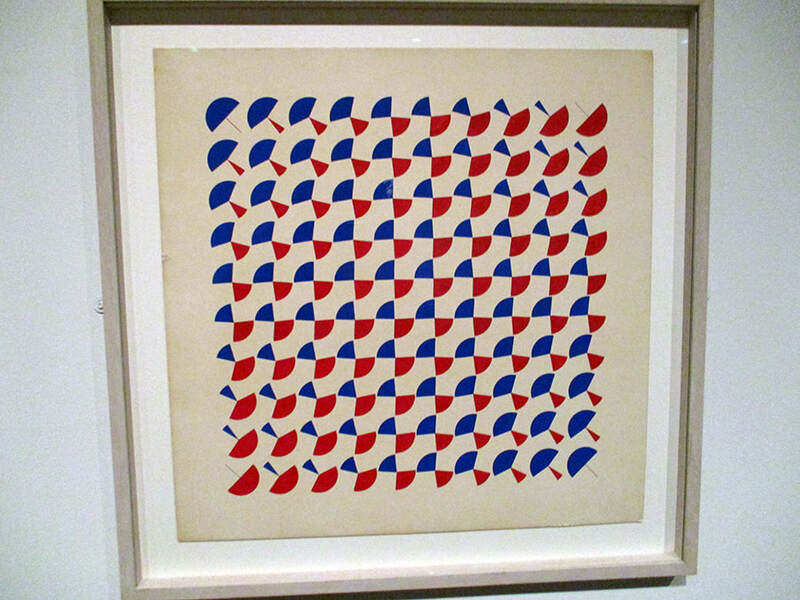 Caught in the process of moving - - "Form Contortion Over Weft" (1966) creates different images as the center strips move over the background.